SMRT taxi driver, Simon Ngiam Shu Leng, with the lifesaving HeartSine AED. Photo courtesy of SMRT. 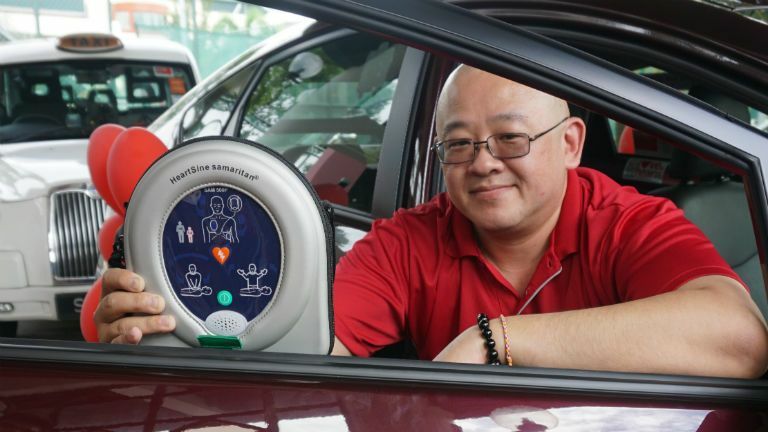 The program, called SMRT-Temasek Cares AED on Wheels, aims to save lives by equipping 100 taxis with HeartSine® samaritan PAD Automated External Defibrillators (AEDs) that will be used by taxi drivers within a 1.5 km/1 mile radius of an actual SCA event. In the event of an SCA, the taxi drivers will be immediately alerted via a mobile application, allowing them to reach the victim as soon as possible to begin lifesaving measures. The HeartSine samaritan® AED, a 1.1 kg/2.4 lbs device that analyzes the heart rhythm and can deliver an electrical shock to victims of SCA in order to restore the heart to normal rhythm, will guard passengers and anyone within the mobile application’s radius of an SCA, a life-threatening condition in which the heart stops beating without warning. Click here to watch and read the full news feature.